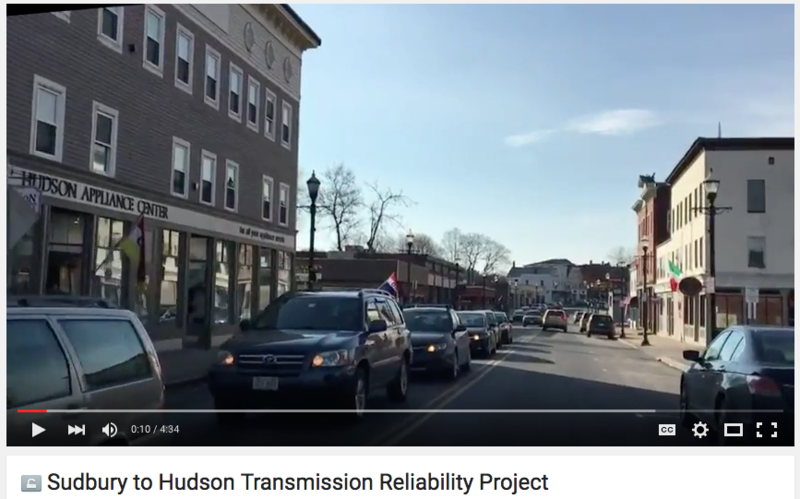 The euphemistically named “Sudbury to Hudson Transmission Reliability Project,” has provided us with plenty of opportunity to get to know Eversource in the last month or so. Their powerpoint presentations online and in community meetings are slick and shiny with references to concern for community and environmental impact. Their vegetation management plan runs over a hundred pages and talks of ‘supporting nature’s ability to regulate itself.’ Their corporate video about the proposed project shows footage of driving local roads and through downtown Hudson with a soothing voiceover. What it does not show is shots of the Sudbury, Marlboro, and Stow forests and wetlands through which it would like to plow transmission lines and/or poles. And the comments on the video are disabled – so Eversource gets their say, but we don’t get ours. But people who already live in areas of Massachusetts with transmission lines rights of way managed by Eversource have something to say. In case you’re wondering, it’s not all good. On Cape Cod, where Eversource manages 150 miles of right of way, individuals and organizations are speaking up to voice their concerns about Eversource. The Mass Breast Cancer Coalition (MBCC) has been reporting for several years (2014, 2015, 2016) that Eversource/NStar contractors on Cape Cod spray herbicides in a manner that violates the yearly operational plan that it submits to state regulators. It has also observed that state and federal laws that regulate the spraying infringements on people’s private property aren’t stringently enforced by state agencies, so there’s not much comfort in hoping that regulation enforcement will keep Eversource in check. Multiple advocacy organizations on the Cape including MBCC, GreenCAPE, APCC, and POCCA have all voiced objections to NStar and now Eversource’s poor record of notifying the public of when and where herbicides will be applied. In 2015, the right of way spray notice for Barnstable, Bourne, Dennis, Eastham, Falmouth, Harwich, Mashpee, Orleans, Truro, Wellfleet, and Yarmouth notified residents that treatment periods would run from September 14th to December 31. A three and a half month window of when spraying might take place is alarmingly unspecific for abutters whose children and pets might be using those areas, or whose gardens might be lucky enough to carry on producing into the late autumn (which has been known to happen in New England). And in the years leading up to these complaints about herbicide infringements, NStar’s mechanical vegetation management had been particularly devastating. A four-year herbicide spraying moratorium was imposed in 2009 after Cape Cod towns signed a resolution against spraying in response to health and drinking water contamination concerns. 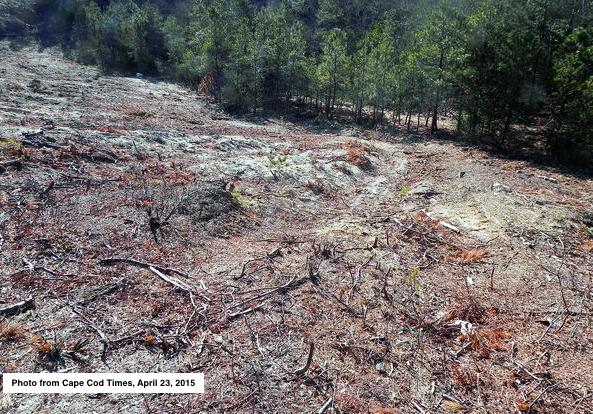 In one case in Falmouth in 2011, a resident’s property was clearcut to such an extent that in 2015 he filed suit for destruction of property. His acre parcel of oak and white and pitch pines became a stump-filled wasteland of sand and gravel, with even the topsoil stripped, suffering long term erosion. Where’s the management in that Eversource? 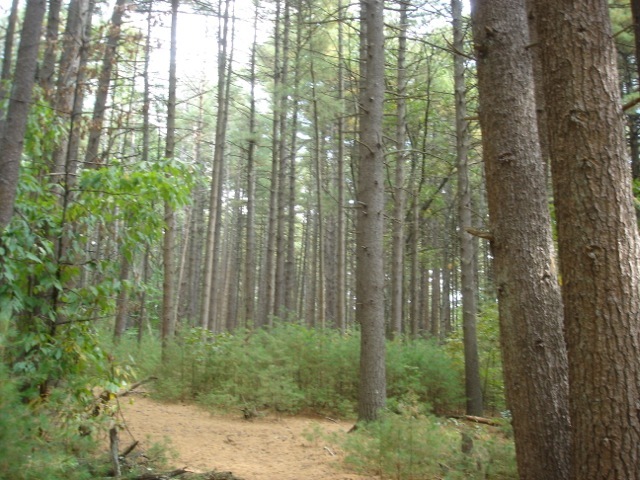 Closer to home, starting in 2012, in what WBUR calls a drastic change to NStar’s approach to tree maintenance, in Sudbury, Wayland, Framingham and Natick, and parts of Sherborn, NStar and now Eversource started an aggressive program to completely clear cut under transmission lines. In other words, they went from managing the vegetation to decimating it. At the time, Representative Tom Conroy characterized NStar’s new approach as overzealous in terms of pushing the limits of their legal rights and easements dating back to the 1950s. Kris Lutz in Sudbury even testified before a Board of Selectman’s meeting that NSTAR crews had ripped out a sandbox, roses, sprinkler heads, and a cable line. Eversource has presented itself as a responsible, concerned corporate citizen that wants to work with the community as it pushes to get the “Sudbury to Hudson Transmission Reliability Project” approved. Its PR machine talks of keeping the lines of communication open, proactive municipal and community outreach throughout the project duration, and community groups as stakeholders. But all of this rings hollow. Look around you Eversource. The evidence is not in your favor. Your corporate citizenship is debunked. You can throw all the corporate PR you want at us. How you operate in the communities you already serve tells us all we need to know. This is a great summary of what we can expect to see from our ‘responsible’ utility company. They are the ‘guest’ you never wanted to invite, the ‘guest’ that never leaves and the ‘guest’ that doesn’t clean up after themselves all rolled up on one.